Houston Jewelry has one of the finest on-site fine jewelry manufacturing and repair facilities in Houston. Our master gold smiths and diamond setters have decades of service with Houston Jewelry. We have in house designers available to handle your custom design requests, corporate gift creations and all of your fine jewelry repair needs. Our fine jewelry design, manufacturing and repair facility is staffed by master craftsman each averaging over 20 years of experience. We will set all diamonds, and size all rings at Houston Jewelry while you wait. Our fine jewelry design, manufacturing and repair facility is staffed by master craftsman each averaging over 20 years of experience. Whether you want to restore a cherished family heirloom, or want to create your own bespoke piece of custom jewelry, our master jewelers can accomplish the task. We will set all diamonds, and size all rings at Houston Jewelry while you wait. Houston	Jewelry	is also an authorized jeweler of the exclusive Finger Mate expandable ring shank system. 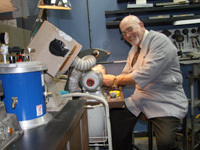 At Houston Jewelry, watch repair services are performed by highly skilled technicians with decades of service. Our watch makers are specially trained by our watch vendors to provide the highest level of service. Our shop has state of the art timing and testing equipment so we can accurately diagnose problems with all types of watches. We have an extensive stock of genuine parts, and service is performed to recommended tolerances. We regularly restore antique and vintage watches, and when new parts are not available our skilled watchmakers have the ability to fabricate and machine new parts using age old watchmaking skills. Our technicians are not merely "parts changers" but fully qualified watch makers. Estimates are given at no charge prior to proceeding with your repair or restoration. We offer a one-year limited warranty on each watch receiving complete recommended service.